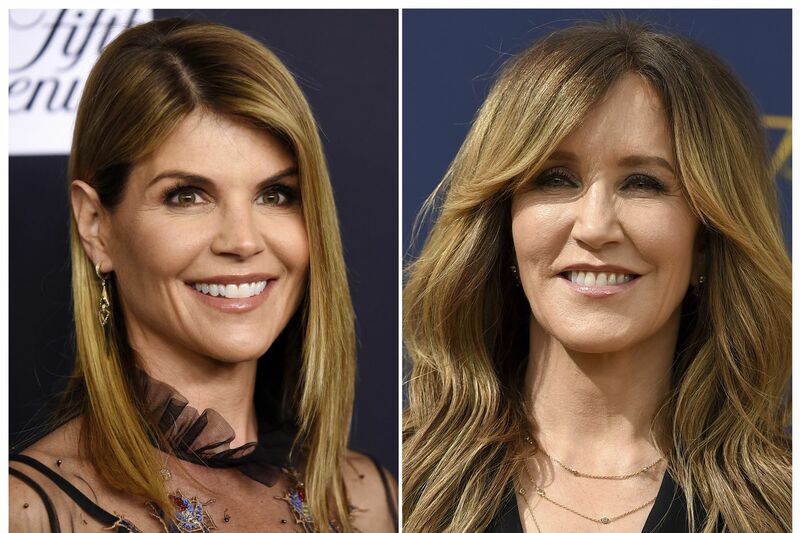 Actresses Lori Loughlin and Felicity Huffman are among at least 40 people indicted in a sweeping college admissions bribery scandal. Both were charged with conspiracy to commit mail fraud and wire fraud in indictments unsealed Tuesday in federal court in Boston. WASHINGTON - The Justice Department on Tuesday charged 50 people — including two television stars — with being part of a long-running bribery scheme to get privileged kids with lackluster grades into big-name colleges and universities. The alleged crimes included cheating on entrance exams, as well as bribing college officials to say certain students were coming to compete on athletic teams when those students were not in fact athletes, officials said. Numerous schools were targeted, including Georgetown, Yale, Stanford, the University of Texas, the University of Southern California and UCLA, among others. Boston's U.S. attorney, Andrew Lelling, called it the largest ever college admissions scam prosecuted by the Justice Department. Of the 50 people charged as part of the FBI's Operation Varsity Blues, 33 were parents, officials said, warning that the investigation is ongoing and others could be charged. The massive, nationwide scheme was discovered accidentally by the FBI - while working an unrelated undercover operation, officials said. That tip led to a sprawling, nationwide corruption probe. "These parents are a catalog of wealth and privilege," said Lelling. "This case is about the widening corruption of elite college admissions through the steady application of wealth combined with fraud. There can be no separate college admission system for the wealthy, and I'll add there will not be a separate criminal justice system either." None of the students were charged because prosecutors said their parents were the scheme's principal actors. Court filings released Tuesday paint an ugly picture of privileged parents committing crimes to get their children into selective schools. Among those charged are actresses Felicity Huffman, best known for her role on the television show "Desperate Housewives," and Lori Loughlin, who appeared on "Full House," according to court documents. A representative for Loughlin declined to comment. A representative for Huffman did not immediately return messages seeking comment. Singer is charged with taking about $25 million from 2011 to 2018 - paying some of it to college coaches or standardized testing officials for their help rigging the admissions process and pocketing the rest, according to the criminal complaint. He allegedly disguised the money using a nonprofit, the Key Worldwide Foundation, prosecutors said, characterizing it as a slush fund for bribes. One of the cooperating witnesses, according to court documents, is a former head coach of Yale's women's soccer team, who pleaded guilty in the case nearly a year ago and has since been helping FBI agents gather evidence. That coach, who was not identified by name, allegedly took a $400,000 bribe to place a student on her team roster, help get her into the school, even though that student did not play competitive soccer, officials said. That student's parents paid $1.2 million in bribes, officials said. Some of the defendants are accused of bribing college entrance exam administrators to facilitate cheating - by having a smarter student take the test, providing students with answers to exams or correcting their answers after they had completed the exams, according to the criminal complaint filed in federal court. Loughlin and her husband, fashion designer Mossimo Giannulli, were accused of paying $500,000 in bribes so their two daughters would be designated as recruits for the University of Southern California crew team - even though they were not part of the team. That helped the pair get into USC, according to the complaint. "We understand that the government believes that illegal activity was carried out by individuals who went to great lengths to conceal their actions from the university," the statement says. "USC is conducting an internal investigation and will take employment actions as appropriate. USC is in the process of identifying any funds received by the university in connection with this alleged scheme. Additionally, the university is reviewing its admissions processes broadly to ensure that such actions do not occur going forward." Huffman is accused of paying $15,000 - disguised as a charitable donation - to the Key Worldwide Foundation so her oldest daughter could participate in the scam. A confidential informant told investigators that he advised Huffman he could arrange for a third party to correct her daughter's answers on the SAT after she took it. She ended up scoring a 1420 - 400 points higher than she had gotten on a PSAT taken a year earlier, according to court documents. Other defendants include William McGlashan, chief executive and founder of a private equity firm, and Jane Buckingham, chief executive of a boutique marketing firm in Los Angeles. Last June, Buckingham agreed to make a "donation" to Key Worldwide of $50,000, in exchange for someone taking a college entrance test on her son's behalf the following month, authorities say. The FBI secretly recorded Buckingham talking to one of the people arranging the test for her son. On the tape, according to the complaint, Buckingham talks about the complicated logistics of cheating on the test and said, "I know this is craziness, I know it is. And then I need you to get him into USC, and then I need you to cure cancer and [make peace] in the Middle East."